Once your application to go on Erasmus is approved, all parties (student, host institution and sending institution) need to sign the Learning Agreement. The Learning Agreement is a negotiated agreement between you (Erasmus student), your home and host institution. It indicates, prior to the study period, what modules you will be studying during your exchange and how many ECTS are allocated to those omponents.It is an informal agreement, but according to the Erasmus Student Charter you have a right to be provided with it before you go abroad. 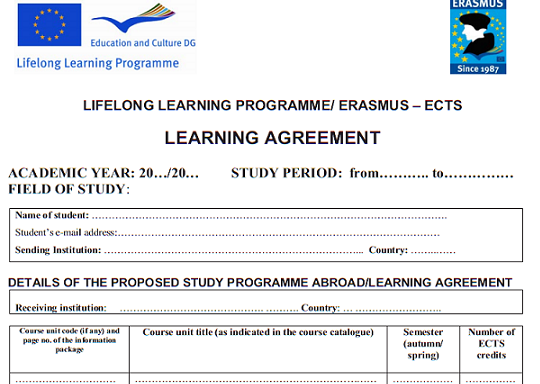 The European Commission provides institutions with a template form of the Learning Agreement. Most of the institutions use this recommended form of the Learning Agreement, however it may occur in your institution that the LA will look differently. After the end of the exchange, the host institution will give you and your home university a Transcript of Records, a document showing which of the courses from the Learning Agreement you attended and successfully completed. Recognition of all those modules as an integral of your curriculum is an obligation for your home institution. How to choose courses in your Learning Agreement? To fill in the Learning Agreement, you need to make a choice of courses. It is very important that you choose the courses that suit you best, in order to benefit most from the exchange and to get them recognised when you come back. Start with looking at the programme at your home institution for the semester you want to go abroad. Which courses are the obligatory ones? 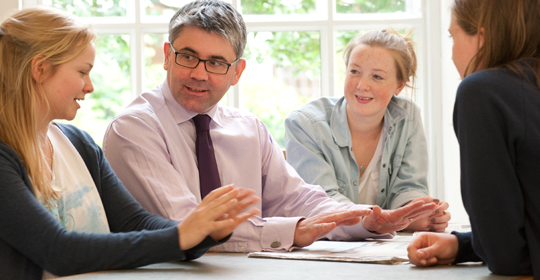 How many ECTS do you have in free electives? Try to suit your choice to the programme of your home institution. Do not decide on your own! After having reached the preliminary choice of interesting courses, visit your Erasmus Coordinator and ask for advice. Pay attention to the schedule of the courses at the host university. Usually Erasmus students are allowed to choose from a variety of courses from different years, specializations or even faculties. Therefore, it might happen some of the courses you would like to take will overlap. To avoid this situation and future changes in the Learning Agreement, make sure you check the timetables before you make a final decision of the courses. What are ECTS? The European Credit Transfer and Accumulation System (ECTS) was developed by the European Commission to allow the transfer of learning experiences and outcomes between different institutions. Its aim is to facilitate student mobility and allow more flexible ways to gain degrees. ECTS credits are based on the workload students need in order to achieve expected learning outcomes. Workload indicates the time students typically need to complete all learning activities (such as lectures, seminars, projects, practical work, self-study and examinations) required to achieve the expected learning outcomes. Each course component (lectures, trainings, seminars etc.) have an allocated number of ECTS. 60 ECTS credits are attached to the workload of a full-time year of formal learning (academic year) and the associated learning outcomes. In most cases, student workload ranges from 1,500 to 1,800 hours for an academic year, whereby one credit corresponds to 25 to 30 hours of work. Institutions which apply ECTS should publish their course catalogues on the web, including detailed descriptions of study programmes, units of learning, university regulations and student services.Credits awarded in one programme may be transferred into another programme, offered by the same or another institution. Partner institutions should agree in advance on the recognition of periods of study abroad. Ask your Erasmus coordinator about the minimum and maximum number of credits your Learning Agreement should contain. Usually, you will have to gain 30 ECTS to complete the semester. After finalising your Learning Agreement, it needs to be accepted. First you need to sign it, and then also your coordinators from home and host institution need to approve it. First give it to your coordinators in your home institution, and then send it to the host university. Remember the Learning Agreement needs to be accepted and signed before your departure, so you need to start this procedure as early as possible. The grading systems vary a lot at different Higher Education Institutions in Europe. Most probably your home and host institution also use different grading scales. The differences in ading in different countries are natural; however it is really important that the transfer of grades is transparent, as sometimes grants or other benefits may depend on your level of performance also during the exchange. A lot of students complain that their grade transfer was not done properly and the whole procedure was not transparent. the host university of your choice.